If you want to have Internet access while still being able to receive files from your card, you'll have to add an "Internet Hotspot" (such as your home network or the iOS Personal Hotspot) to your card settings. 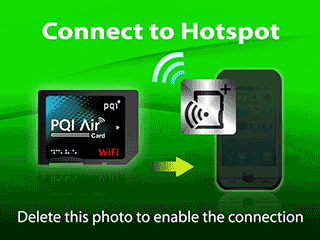 Join the PQI Air network and go to 192.168.1.1 in your browser. The SSID for the AP Hotspot is the name of the Wi-Fi network. Note: If you have more than one PQI card, change the Wi-Fi Information -> SSID name to something unique for each card. That way you'll be able to distinguish between them if they're connected to ShutterSnitch at the same time. This will force the card to leave it's normal mode and join your wireless network. Now join the same Internet Hotspot on your iOS device (or do nothing if that network is the iOS Personal Hotspot - in this case you're already connected). Start ShutterSnitch and if this is your first time setting things up, go to the collection overview and tap the Options button in the top left-hand corner and pick "Setup Guide". Then tap "PQI Air card" and "Done". Enter a collection, and if the card has joined the network, it'll connect and be ready to receive photos. If the card hasn't joined the network yet, ShutterSnitch will patiently keep looking for it. If it's the first time you pair the two in this mode, it can take little a while.